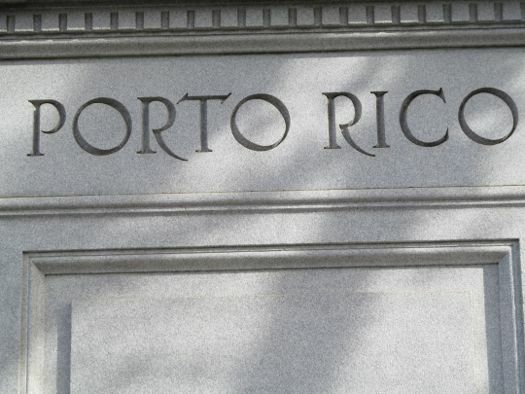 Porto Rico -- set in stone. After they're up for a while, statues and monuments can just become part of the landscape --that thing you pass by everyday on your way to work or the grocery store. You might give them a fleeting thought as you drive or walk by -- or you might not. One thing that can make a statue stand out and get your curiosity going, though -- an error. 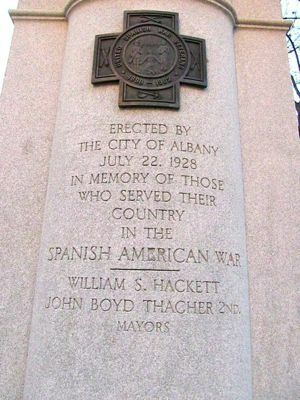 An error like the one on the towering Spanish American War monument in Albany's Townsend Park, where a statue of an armed soldier rests on a stone base, each side listing one of four territories involved in the warL "Cuba, Hawaii, Philippines and Porto Rico." Wait, what? Yep. "Porto Rico." Before you etch something in stone, you'd think you'd have a proofreader look it over. One proofreader, at least. Yet somehow "Porto Rico" slipped by. So how does an error like that get etched into stone for all eternity? Albany city historian Tony Opalka says the answer is actually pretty simple. "It comes from an ignorance of the language," says Opalka. "It was a different time and people didn't really know how to spell Spanish words." The memorial was erected in 1928. In the Treaty of Paris, signed at the end of the Spanish-American War in 1898, Puerto Rico was spelled "Porto Rico." Thirty years later, when the monument was erected, Americans were still spelling it incorrectly. Finally, in 1932, Congress changed the spelling back to the correct "Puerto Rico," leaving many official documents and memorials from the time looking a little silly. But that's not the only confusing thing about the monument. The memorial is dedicated to the efforts of soldiers in the war and depicts a Spanish-American War soldier hunched over, rifle at-the-ready, complete with an ammunition belt, a knife and a canteen. But instead of being called something like "The Soldier" or "Ready for Battle," its title is "The Hiker." Why? The title is a reference to what soldiers in the Spanish-American and Philippine-American wars called themselves -- hikers -- kind of like the term "doughboy" was used in WWI. 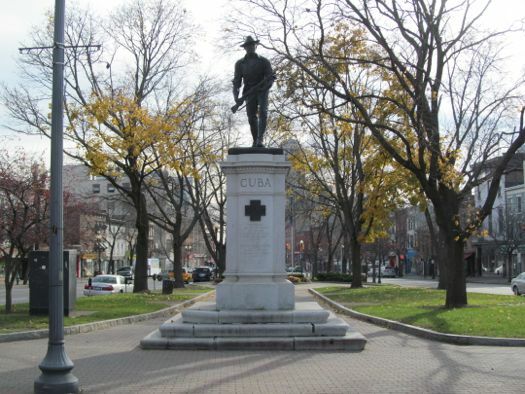 A number of Spanish American War monuments were called "The Hiker," including one by sculptor Theo Alice Ruggles Kitson, copies of which are in Troy and Schenectady. The sculpture atop the Townsend Park monument was designed by another artist - David Cunningham Lithgow, a native of Scotland who settled in Albany when he emigrated to the US in 1888. Lithgow is also responsible for a number of murals in the Capital Region, including one in the Proctor's Theater in Troy and and some in Milne Hall on UAlbany's downtown campus. And Lithgow leads us to yet another error in the Townsend Park memorial: the artist's name is incorrectly etched into the monument as "D.C. Lithcow." "The Porto Rico thing was probably in the sculptor's design," says Tony Opalka, "but I don't think he would've wanted his name misspelled. That was just a mistake." Thanks for researching the background of this statue. I used to live on that block and always wondered why Puerto Rico was spelled that way. Yeah, that always caught my eye whenever I walked by. But I just assumed it was some kind of alternate spelling from an earlier century, like plough/plow or naught/nought. This was not a mistake when the statue was made. It was common in the U.S. at the time to spell Puerto Rico this way. Only Bob and Paul are right. Porto Rico is an older spelling both in English and in Spanish. An article was recently published in Spain on the subject. Yes, that's the article I had in mind ("The Politicization of a Monophthong: A Refutation of All the Puerto Rican Myths About the Native Spanish Place Name Porto Rico"), but if you use that Internet address, you will see only a few snippets. To see thirty-seven entire pages, put "Porto Rico David Gold Refutation" into your Google search bar (with Yahoo's search engine they will not work) and scroll down to the website called "Estudios de linguÃ­stica espaÃ±ola. Homenaje a Manuel Seco." As the author notes, the earliest evidence for the spelling with o in Spanish (native Spanish, of course) is an official map drawn in Seville and published by the Spanish government in 1562; in later native Spanish texts, it is found down to 1945 at least; and the earliest evidence for that spelling in native English dates to 1698. My daughter-in-law, who is from Venezuela, says that the city of Puerto Cabello in that country used to be called Porto Cabello. If you check an atlas, you'll see that a city in Ecuador is to this day called Portoviejo. English too has place names that preserve archaic or obsolete forms or spellings. For instance, the name of Dutchess County, established in 1683, honors Mary Duchess of York, the wife of James Duke of York, who later became King James II. Today the common noun is spelled duchess but in the 1680s one way of spelling it was dutchess. In Spanish and English, Porto Rico is merely a now archaic form. Further to my earlier post, several websites reproduce in facsimile the official Spanish map of 1562 with the Spanish name Porto rico (indeed spelled there with a lower-case r), for example, the one at memory.loc.gov/ammem/gmdhtml/gutierrz, and David L. Gold reproduces the relevant portion of it on page 231 of his article (the page can be seen at books.google.com/books?isbn=8497171837). Contrary to what I said in my post of January 21, going to books.google.com/books?isbn=8497171837 will NOT lead you to the reproduction of the map in David L. Gold's article. Rather, as suggested in my post of January 17, put the words "Porto Rico David Gold Refutation" into Google's search bar and scroll down to the website called "Estudios de linguÃ­stica espaÃ±ola. Homenaje a Manuel Seco." Click on the website and scroll down to page 231. I apologize for any inconvenience. Another English spelling that survives marginally is New-York. In 1804, when The New-York Historical Society was established, that was a frequent, maybe the usual, spelling (The New-York Times, founded in 1851, did not become The New York Times until 1896) and to this day the society's name includes the hyphen. In my last post I was imprecise with respect to The New York Times. New-York Daily Times appeared from 18 September 1851 to 12 September 1857. On 14 September 1857 the newspaper began appearing as The New-York Times (13 September 1857 being a Sunday, no issue was published on that day) and so appeared until 30 November 1896. On 1 December 1896 it started appearing as The New York Times. I hope that nobody now has in mind suggesting that a hammer and chisel be taken to the base of "The Hiker" and the o of Porto changed to ue. In response to Miguel Toledano (January 23), nobody, fortunately, appears to have taken or suggested taking a hammer and chisel to the spelling Porto Rico on the base of The Hiker, but other despicable means were tried in 1988 to "correct" that legitimate spelling: "City parks workers hope today to finish cleaning graffiti off the city's 60-year-old Spanish-American War monument, which was discovered defaced late last week. Deputy Parks Commissioner Richard Patrick said the vandalism involved markings that have proved difficult to remove [...]. 'Every day it's on there it's a victory for whoever put it there' [...]. The damage to the statue included a change of spelling on the monument from 'Porto Rico' to 'Puerto Rico,' said Patrick, who speculated that the act might have been a 'misguided patriotic gesture.' 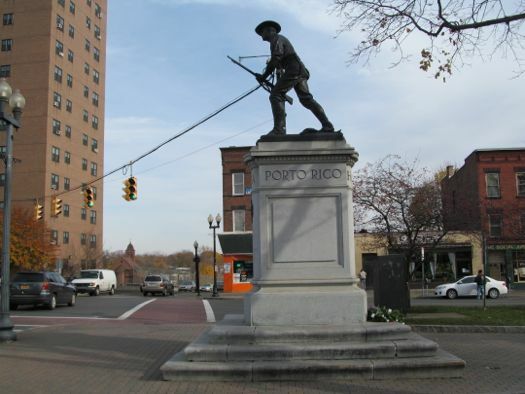 'Porto Rico' was once an accepted spelling for the island, which became a U.S. territory after the Spanish-American War" ("Albany Crews Clean Marker Hit by Vandals," Times Union, September 13, 1988, p. B2). The vandals, besides being vandals, were ignorant of older Spanish and of older English. The base of the statue shows the names of two mayors of Albany, William Stormont Hackett and John Boyd Thacher 2nd. On March 4, 1926, Hackett, then mayor, was killed in an automobile accident in Havana, Cuba, whereupon Thacher was named acting mayor. In November 1929, Thacher ran for mayor and was elected for a four-year term (reelected in 1933 and 1937, he served in that post until 1940). The statue was unveiled on July 22, 1928. That Thacher's name appears on the base is thus understandable, but why does Hackett's? Was the plan to erect a monument honoring the Albanian soldiers in the Spanish-American War conceived during his mayoralty? Did he himself conceive it? Was it felt that had he lived, the statue would have been unveiled during his term in office and therefore he too deserved commemoration? For some other or additional reason or reasons? After researching the "Porto" nomenclature for about 5 years, I must say that the comments by Sol, Rafael, & Miguel are the best evidence-based explanations I have read about the historical variant spellings of "Puerto." Yet if you read American newspapers dating shortly after the Spanish American War (1899-1901) you will find editorial arguments for and against the spelling. The problem of the times was not the spelling but the attitudes of politicians of the times. Whether it was written in maps Porto Rico I believe was a Portuguese way of writing it. I have found many birth certificate pre 1898 Spanish=American war and it is written Puerto Rico. There are many other official documents before that time that were written Puerto Rico. If you read the decree it is in Spanish and English. Written in the Spanish Puerto Rico and in the English portion written either using the English or Portuguese term. No, Frank, not in Portuguese. You have not read David L. Gold's article, for which a full reference is given above. Porto Rico is older Spanish.